Do you ever feel like a nutritious breakfast is out of reach because it’s just too time-consuming? Try a Hawaiian Crunch Wrap! 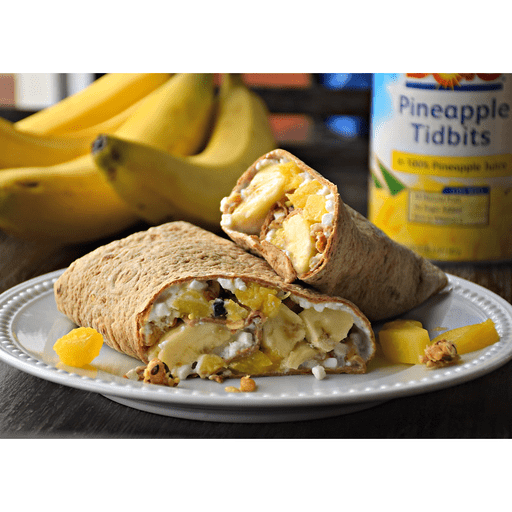 These yummy breakfast wraps take less than five minutes and are packed with hunger-fighting protein and fiber, to help you get a nutritious meal while on-the-go! 1. Spread tortilla with cottage cheese. 1. Top cottage cheese with pineapple and granola. 1. Place banana halves, cut side down onto the wrap. Roll the wrap tightly enclosing all of the toppings. Slice in half and serve. For gluten free: Use gluten free tortilla instead of whole wheat and gluten free granola instead of standard granola. Calories 460, Total Fat 7g (Saturated 1g, Trans 0g), Cholesterol 5mg, Sodium 810mg, Total Carbohydrate 83g (Dietary Fiber 12g, Sugars 33g), Protein 25g, Vitamin A 4%, Vitamin C 80%, Calcium 10%, Iron 20% *Nutritional values are an approximation. Actual nutritional values may vary due to preparation techniques, variations related to suppliers, regional and seasonal differences, or rounding.